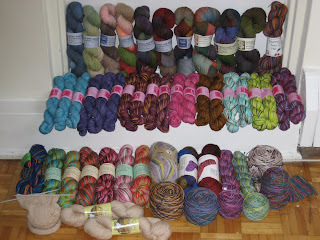 I don't like to think of myself as a yarn hoarder. A yarn aficionado, yes. One that is appreciative of all things woolly, yes. A hoarder, never! That is why, during a fit of reorganization I found this to be especially troubling. That is enough sock yarn to knit 34! pairs of socks. Sadly (or happily depending on how you see these things) this doesn't include the 4 skeins currently winging their way to me. This combined set of factors was enough to convince me it was time to consider picking up these again. This sock is in its sixth incarnation. It started off as a plain toe-up. It then found life as a top-down jaywalker, which was later ripped to make way for a larger jaywalker. After some serious pooling, it became a sock of my own design. Problems with the design led to a sock with a clock/cable motif down the side and now it's been ripped back to once again become a plain old sock. The picture above is one taken during life #5, the clock phase, and thus is a little outdated. 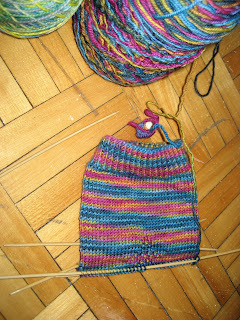 I'm still not loving the plain sock but I've decided there's no fighting the yarn on this one. It if wants to be a plain sock, then and a plain sock it'll be. Also, I've finished knitting and blocking all the pieces for the sand dollar pullover. More on that next time. Posted by Amanda at 2:05 p.m.
Woah--I guess I better hope I don't have a fit of reorganization (unlikely, I must admit!). You do have some beautiful yarn, and what dedication on that oft-knitted sock--I say, go for the plain! April 21, 2007 at 11:06 p.m.
April 22, 2007 at 10:01 p.m.
Wow, nice stash. Very very nice selection of brands too! I would be too chicken to flash my sock stash! April 29, 2007 at 2:29 p.m.
May 16, 2007 at 6:04 p.m.